Peter Graaff (of the Netherlands) was Acting Special Representative and Head of the United Nations Mission for Ebola Emergency Response (UNMEER) from 25 April 2015 until the mission closed, on 31 July 2015. Mr. Graaff’s first posting with WHO was in the Regional Office for the Eastern Mediterranean Region (EMRO), Egypt. This was followed by postings as the Essential Drugs Programme Coordinator in Malawi and Kenya, and as the Regional Advisor for Essential Medicines in EMRO, where he was responsible for technical and operational support to 23 countries. He subsequently worked in Geneva as team-leader of the Aids Medicines and Diagnostics Service, and as WHO Representative in Afghanistan, Haiti and most recently Liberia, where he was the Ebola Crisis Manager for UNMEER since October 2014. 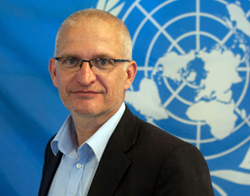 Before his move to Liberia in August 2014 as WHO Representative and subsequently as UNMEER Ebola Crisis Manager, Peter was the Director for Civil Affairs and Development of the United Nations Assistance Mission in Afghanistan (UNAMA) where he was responsible for the 13 field offices as well as the Civil Affairs, Rule of Law and Police Advisory Units. Born in 1960 in Heerde, the Netherlands, Mr. Graaff is a graduate of Leiden University (MSc, 1986) and Heriot-Watt University (MBA, 2003). He has spent over 25 years working for the World Health Organization (WHO) in Afghanistan, Haiti, and a number of countries across Africa. Read the full biographical note. 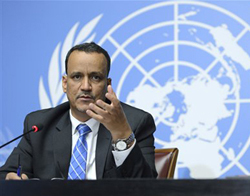 Ismail Ould Cheikh Ahmed (of Mauritania) was Special Representative and Head of the United Nations Mission for Ebola Emergency Response (UNMEER) from 4 January 2015 to 25 April 2015, when he was named as the Secretary-General's Special Envoy for Yemen. Bringing more than 28 years of development and humanitarian assistance experience with the United Nations in Africa, the Middle East and Eastern Europe, Mr. Ould Cheikh Ahmed was previously Deputy Special Representative of the Secretary-General and Deputy Head of the United Nations Support Mission in Libya (UNSMIL), United Nations Resident Coordinator, Humanitarian Coordinator and United Nations Development Programme (UNDP) Resident Representative. He served as Resident Coordinator, Humanitarian Coordinator and UNDP Resident Representative in Syria (2008-2012) and Yemen (2012-2014). He held several positions with the United Nations Children’s Fund (UNICEF), including as Director of Change Management in New York, Deputy Regional Director for Eastern and Southern Africa in Nairobi, and Representative in Georgia. Born in 1960, Mr. Ould Cheikh Ahmed holds a master’s degree in human resources development from the University of Manchester, a bachelor’s degree in economics from the University of Montpellier and an Advanced Certificate in Economics and Social Policy Analysis from Maastricht Graduate School of Governance. Read the full press release. Anthony Banbury (of United States) was Special Representative and Head of the United Nations Mission for Ebola Emergency Response (UNMEER) from 8 September 2014 to 3 January 2015. He brought more than 25 years of experience in political, peacekeeping, and emergency management roles across several different regions and organizations. Prior to his UNMEER appointment he had served as Assistant Secretary-General for Field Support from June 2009. He also served as Acting Deputy Special Representative in the United Nations Stabilization Mission in Haiti (MINUSTAH) after the 2010 earthquake, and was the Asia Regional Director for the World Food Programme in Bangkok from 2003 to 2009, where he managed humanitarian relief and development operations in 14 countries. He also was an integral part of the relief operations for the 2004 tsunami and the 2008 Cyclone Nargis. 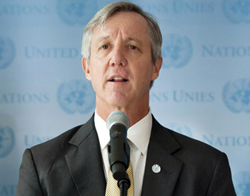 Anthony Banbury’s appointment followed the unanimous adoption of General Assembly resolution 69/1 on 19 September 2014, and the adoption of Security Council resolution 2177 (2014) on the Ebola outbreak. Read the press release.